Now you can get the advantages of DMT diamond sharpening and the convenience of a pull through vee sharpener in one tool. DMT diamonds sharpen fast and work on any steel. Vee sharpening works both sides of the blade at once while providing guidance to ensure a constant angle. The DiamondVee from DMT combines both features in a handy, portable, adjustable tool. The DiamondVee uses DMT's fine grit. When you want one grit to do it all, the fine 600 grit is the one to use. Aggressive enough to reestablish an edge, but fine enough to create a smooth cutting blade. The DiamondVee is easy to store and carry. The diamond sharpening rods and hand guard pivot between sharpening and storage positions. The handle itself opens to provide safe, convenient storage when not in use. PErfect for home or field use. There is no need to compromise with the DiamondVee. 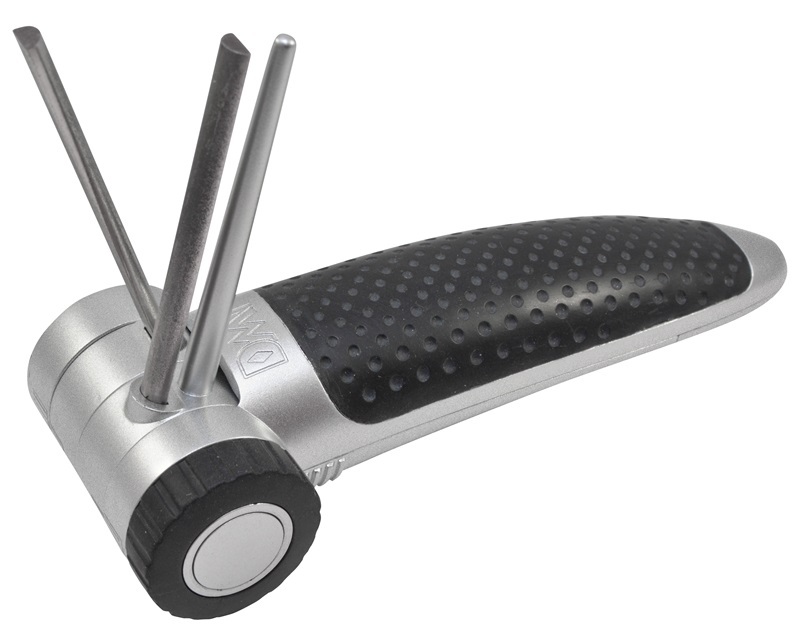 The diamond coated rods are adjustable to sharpen at angles from 10 to 20 degrees. Position the rods, turn the locking knob to hold them in place, and you're set. The diamond rods are 2.83" in length. The full sharpener is 6 3/16" x 2 1/4" x 1 5/16". Sharpening rods made in USA; other components made in China.